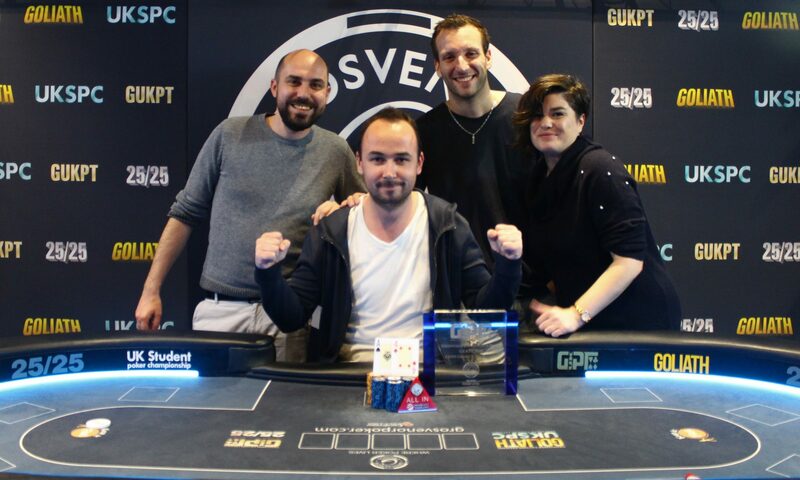 GUKPT 2018 ends in style as top 3 finishers take home £100k+ at the Grand Final! That’s a wrap for season 12 of Grosvenor Casinos’ GUKPT. As always The Poker Room, London, provided the venue for another spectacular GUKPT Grand Final that came to a head this past Sunday. Grosvenor Casinos would like to take this opportunity to thank all of its loyal GUKPT players as well as those who have recently discovered the tour for their support in taking part in what continues to be the UK’s premier poker tour. Frenchman Jermoe Lhostis is the latest face to join the illustrious GUKPT Hall of Fame after beating 324 competitors to the top, taking home a huge £140,445 in cash. This was Jerome’s 5th time taking part in the GUKPT and it certainly won’t be his last. Jerome has nine years of playing at a professional level on his side but he still had his work cut out for him with the likes of UK Poker Star Ludo Geilich on the final table and players such as Katie Swift, Jamie O’Connor, Alli Mallu and recent GUKPT Blackpool winner, Yiannis Liperis, all making a deep run. Grosvenor Casinos continues to enjoy watching all players from different nationalities take part in the tour and the GUKPT Grand Final always showcases the diverse playing field with England, Scotland, Wales, Lithuania, France and Spain all represented. Naturally the £400,000 Guaranteed GUKPT Main Event is always the main attraction but the side events continue to pull in enormous crowds, with the GUKPT London Mini Main welcoming nearly 500 entries, creating a prize pool of £121,000. The 2018 GUKPT may be in the history books but the Grosvenor Casinos poker team isn’t ready to say goodbye to 2018 just yet. The 25/25 will be making stops in Manchester, Edinburgh and Reading before the end of the year. For any players looking for a bargain then Grosvenorpoker.com has many 25/25 seats up for grabs in their weekly direct satellites. In addition, the Christmas Cracker will be returning to seven UK Regions from 17th to 23rd December. These £20,000 Guaranteed regional tournaments are some of the most fun and sociable events on the UK poker calendar and with a combined £140,000 in guaranteed prizes they’re sure to spread plenty of festive cheer. Grosvenor Casinos has recently released details of next year’s poker calendar which includes details of a brand new addition to its tour line up, the Deepstack. It also included details of an all new National League which will see various players throughout 2019 win poker packages to events in 2020.